I love a good cheeseburger. Every time I drive by a Red Robin or Five Guys I want to stop. When Andrew told me that our guest for the evening, one of his classmates that is from China, really enjoys American fare, I decided it was time to put together a Cheeseburger Pizza recipe. Having already had beef three days earlier, I wanted to go with ground turkey for this burger pizza. I added some flavor and spices to the ground turkey and sautéed it with chopped onions. 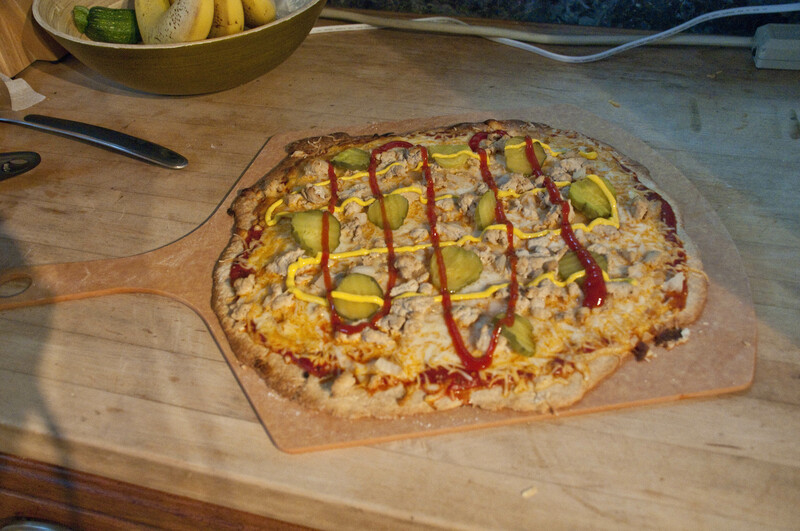 I spread marinara on the dough, Monterey Jack cheese, the turkey mixture and topped it with some pickle slices. Then I turned over my creative hat to Andrew as he decorated the baked pizza with mustard and ketchup. Our turkey burger pizza with all the fixins turned out to be a hit. It definitely satisfied my burger cravings for a while! This entry was posted in cheese, Meal->Pizza, meat, Monterey Jack cheese, Onion, pickle, turkey, veggie and tagged pizza, turkey burger, turkey burger pizza recipe. Bookmark the permalink.